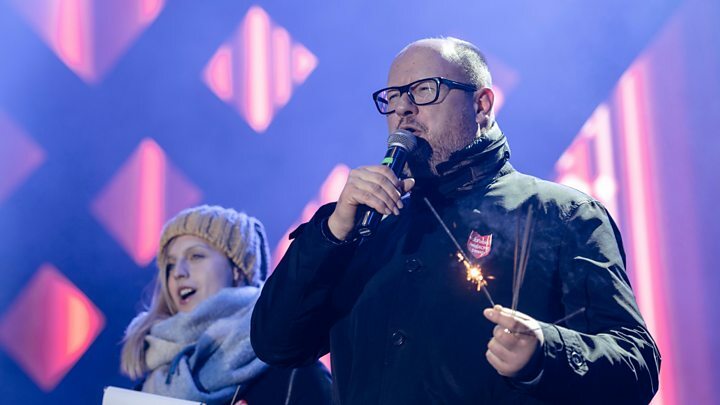 Thousands of Poles have been attending the funeral of Pawel Adamowicz, the mayor of Gdansk who was fatally stabbed last Sunday. Large screens around St Mary’s Basilica in the city and across the country broadcast Saturday’s service live. Mr Adamowicz, a liberal critic of Poland’s ruling party, served as the mayor of Gdansk for 20 years. President Andrzej Duda and European Council President Donald Tusk were among those attending the ceremony. What’s the scene in Gdansk? The service has been held in the vast gothic St Mary’s Basilica, where a black urn containing Mr Adamowicz’s ashes was placed next to the altar, ahead of its permanent placement in one of the chapels. People queued for hours in order to secure a place inside the building, one of the largest brick churches in the world. Mr Adamowicz’s widow and two daughters attended, as did Polish Nobel Peace Prize laureate and ex-President Lech Walesa, and PM Mateusz Morawiecki. Gdansk Archbishop Slawoj Leszek Glodz addressed the service, saying Mr Adamowicz’s murder served as an alarm bell for the people of Poland. “Our homeland needs harmony in politics,” he said. Archbishop Glodz handed gifts from Pope Francis to Mr Adamowicz’s relatives. Some 3,500 people were reported to be inside the basilica, including mayors from across Poland and from other nations. 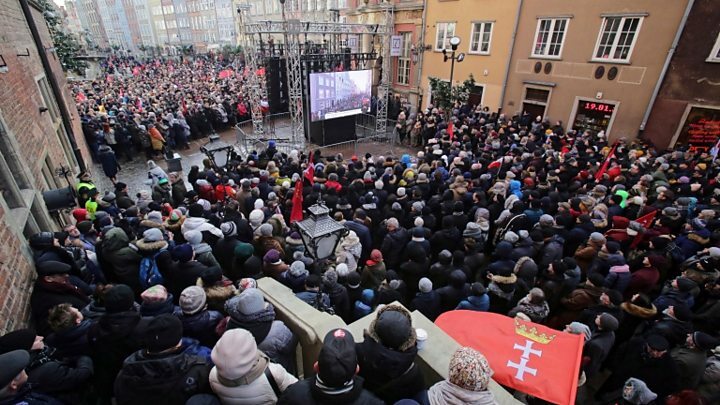 On Friday, a funeral procession was attended by thousands of people who followed Mr Adamowicz’s coffin as it was driven through streets of Gdansk covered in white flowers and the city’s red flag. Mr Adamowicz’s body was then cremated. People have lit candles and gathered to sign a book of condolence at the European Solidarity Centre in the city. Banners displaying black and white images of Mr Adamowicz have been draped over buildings in cities across Poland. Images of the funeral service have been carried on large screens. In the capital, Warsaw, people gathered in the historic Castle Square to watch the broadcast. Mr Adamowicz has been made an honorary citizen of Warsaw. Vigils have been taking place in Polish cities all week, with people expressing shock at the death of the popular city leader. What happened to Mr Adamowicz? Mr Adamowicz, 53, was attacked on stage in front of hundreds of people while attending the Great Orchestra of Christmas charity – an annual event where volunteers raise money for medical equipment in hospitals. Paramedics tried to resuscitate Mr Adamowicz at the scene, before transferring him to a local hospital with stab injuries, where he underwent five hours of surgery. His death was confirmed by Poland’s health minister on Monday. President Duda described the attack as an “evil hard to imagine”. A 27-year-old suspect has been arrested over the attack. Mr Adamowicz was a popular figure – known best for his liberal political views and long tenure as mayor. Mr Adamowicz was from Gdansk and first came to power in 1998. He has been re-elected four times since, most recently in November. After news of the severity of his condition broke, local residents queued at the hospital to donate blood.